Reason: I needed a test quilt for new fill I am trying out. A baby-sized quilt seemed the way to go. Also, I saw Leah Day's modern quilt technique and thought it would be fun to put a "twist" on these traditional 4-patches (haha). 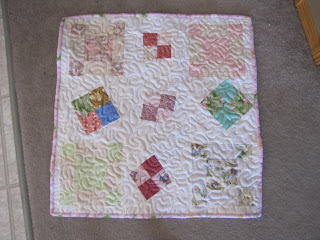 Special Fabrics: Five of the blocks are from dozens and dozens that my grandmother has given me over the years. Lessons Learned: Finally, I think it's been established WHY I had such wavy edges. Leah cautioned against putting too much strain on the edges and I've realized that I practically play tug-of-war to bind my quilts because I'm so close to done I can taste it. When you add the fact that two of my waviest quilts had double machine sewn bindings, it's no wonder they looked rippled. Tipsy Topsy looks much better. Thanks so much, Leah! Thoughts: Although I didn't do the fabulous quilting method that Leah is teaching for this quilt, I definitely want to try it out because it looks amazing. I'm already getting bored of the straight stipple so I need to think about how I can incorporate an all over quilt method to enhance the blocks, not just stitch over them randomly. Also, I think a larger stipple would have looked better on this quilt. 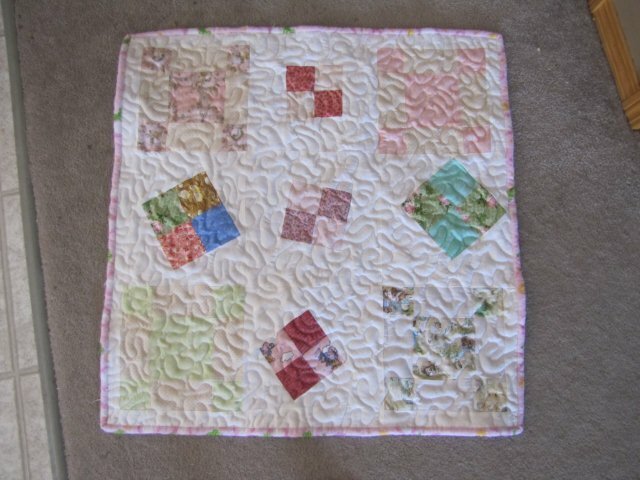 Great to have a baby quilt done! and wonderful to figure out solution to problem with the wavy sides! You've helped us all by sharing that info! Thank you June. I'm so happy to help! Loved the idea of being so closed to done you could taste.